When we took a poll back in December, "Developing Core Strength" was one of the top answers to the question "What element of basketball training are you most interested in?" So we worked with athletic training expert, Jason Ellis, co-founder of Rock and Armor, to give you an exercise that you can add to your workout. Jason is a professional trainer and a former professional basketball player that has played in the NBA D-League and overseas. With great core strength you are going to be able to take a hit and still finish at the rim, maintain your defensive stance when you a defending on the ball, hold off your defender when you are in the post, maintain your position when you are defending the post, get more rebounds in traffic and set better screens to get you and your teammates open for better shots. *Below is a short video that explains the exercise and gives an example of how to do it. There are three phases to this exercise. Phase 1 - Start with a bumper (rubber plate) at the weight of your choice. The example uses about 10 pounds. Lay flat on your back with legs straight in the air, holding the plate with your arms locked out straight. With your arms locked straight, reach up and try and touch your toes 20 times. You want to really emphasize getting your scapulas and shoulders off the ground. Phase 2 - Immediately move from Phase 1 to Phase 2. Transition by keeping your legs straights and moving them down nearly to the ground. Keep them about 1/2 inch off the ground. Sit up and lean back with your arms slightly bent and rotate your truck while keeping your legs straight. Rotate 50 times (25 on each side). Phase 3 - Immediately move from Phase 2 to Phase 3. Bring your knees to the plate (fetal position) while remaining on your gluteus maximus . 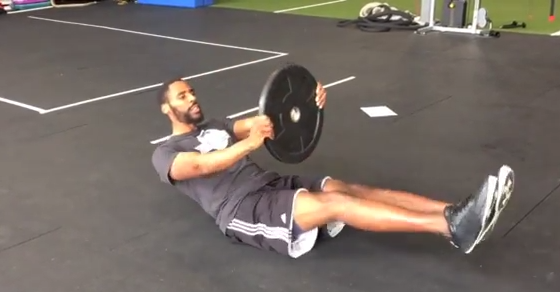 Extend the plate and your legs out at the same time while keeping your balance. After extending out, return to the starting position and repeat for a total of 10 reps. The exercise should take no longer then five minutes to complete two sets with a rest in between. You should feel it in your front abdominals, side obliques and lower back. Modifications: you can adjust the counts as you see fit. For a reduced workout you may try 10-20-6. For an increased workout increase your amounts to 30-60-20. Keep your middle count even so both sides get equal repetition. Looking for more workouts? Click here for "Developing Lateral Quickness"